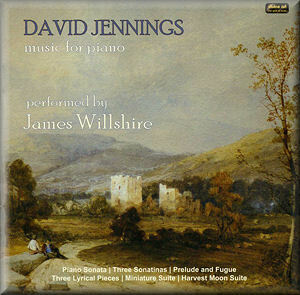 David Jennings was born in 1972, and studied with John Casken. Strongly immersed in music of the British Musical Renaissance he has also been influenced by poetry and the visual arts. He has composed in a variety of forms but this disc concentrates on music for piano. The earliest of these works are rooted in his childhood. The Piano Sonata No.1 was started in 1988 and completed in 1995, though revisions meant that it didn't reach its present form until 2009. A long gestation, certainly. It covers a pleasing amount of stylistic ground: calm initially but soon subject to tauter, twistier material, then a snazzy, jazzy Scherzo with some good rolling left hand. Then there are more calm, almost Debussian harmonies in the Romance third movement with a contrasting section full of velocity. Written in the mid to late 1980s, the three Sonatinas are succinct and highly communicative, revealing baroque hints as well as other kinds of influence. One such is the ‘Satie Barcarolle’ effect of the central Elegy of the first Sonatina or the Bachian elements of the second. One might think that the Prelude and Fugue Op.6 would build upon certain neo-classical elements that are present in the composer's music. However this is a much thornier work altogether and one that enshrines quite a rigorous use of twelve-tone throughout its five-minute length. The Three Lyrical Pieces were written in 2010 and they're very charming 'Old School' pieces which nod to early twentieth-century British piano writing. His next opus was Miniature Suite, which certainly lives up to its name: the five movements last eight minutes in total. This sees Bach gently modified, updated and generally dabbled with, not least via unexpected modulations. The Invention, the third of the movements, sounds like a thoroughly subverted piece from A Bach Book for Harriet Cohen. By contrast the disc ends with Harvest Moon Suite, a series of six charming watercolours, whether gentle of more lurid. The Haunted Abbey, for instance, its title derived from a William Payne painting, is decidedly Hammer Horror, though Harlech Castle is gaunt, and Innisfallen Lake sonorous and evocative. The composer reveals himself to be admirable equipped in writing for the piano and James Willshire seems an ideal interpreter.